If your weekend is approaching a bit too quickly, and you don’t have plans, no worries. That’s exactly what this blog is here for. In fact, each Thursday I’ll bring you some of my favorite events occurring over the coming weekend. So sit back, relax, and take a look at coming plays, exhibitions and festivals that are worth checking out. The Oklahoma Children’s Theatre and the Oklahoma City University School of Theatre team up to present “Treasure Island” this Thursday through Sunday. The performance is based on Robert Louis Stevenson’s novel and includes treachery, adventure and, of course, treasure hunting. But if you’re expecting the play to be set on a nice, calm beach scene, think again. The students and faculty of the Oklahoma City University Theatre have worked hard to make the stage rough and jagged instead, emphasizing unpredictability of the tale. The In Your Eye Gallery opens “Seeing Red” on February 1st. This exhibit, running through the end of the month, features red-infused artwork. The gallery holds an opening reception on Friday evening from 6:00 to 10:00 where attendees can get a first look at the pieces. The twelve artists featured in the collection create everything from blown glass to mixed media, each including some element of the intense color. If an art gallery doesn’t suit your fancy, how about a play in honor of Black History Month? The Metropolitan Library System and Rhythmically Speaking present “Swingin’ and Singin’ on the Deuce” with its first performance on the Saturday. This play harkens back to Oklahoma City’s 2nd Street in its heyday. Watch the actors recreate scenes of music, singing, and dancing in The Deep Deuce. More performances are scheduled throughout the greater Oklahoma City area through the end of February. 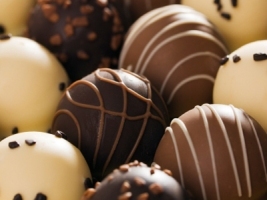 And chocolate lovers can rejoice because the 31st annual Chocolate Festival returns to Norman on the 2nd. The festival, benefitting the Firehouse Art Center, offers two kinds of tastings: regular and premiere. The regular tasting session includes 10 samples, whereas the premiere offers 15 and a drink. Either way, you’ll end up snacking on chocolate amaretto cake, chocolate cinnamon rolls or decadent chocolate fondue. And while you’re getting your fingers dirty with chocolaty goodness, your kids can be getting their hands dirty in the children’s art area.